By Travis - Chile - 02 Apr/03 - Viewed 1664 times. After disembarking the Magellanes at 8:15 on Monday morning in Puerto Montt, we hopped on a 9:00 AM bus to Osorno, Chile. We arranged for a mini-bus to take us to Anticura and the Volcan Puyehue trailhead later that afternoon. After signing in at the ranger station, we walked along the highway for a couple kilometers until we came to a ranch where the trail began. We expected that we would be charged a fee to cross this private property (the rangers had told us it was $3, the guidebook indicated $2.50 per person). When we arrived at the "toll booth" no one was around, so we knocked at the nearest house to raise the gate keeper. A toddler answered the door and immediately told us that she was the only one home, just before her mom scooped her up in her arms. Long story short, we found out that the fee was just over $10.00 per person to cross the private land, and we didn't have that much money on hand (and had some misgivings that we were being had). Abi's and the gate keeper's discussion of the matter became louder and more heated, to the point I was concerned that we were going to have an international incident. Finally, we told her that it wasn't her fault (this calmed her down a lot), just a misunderstanding. She told us we could pass and to talk to her boss on our way out after the trek (we found an alternate route across the property on our return). We were about an hour into the hike and in a high pasture just below the tree line, when the sun went behind a ridge to the west. We set up the tent, made our first campfire of the trip (they were not allowed in the other national parks we visited), and gazed at the stars (hadn't had this opportunity much on our other hikes either, with all the rain we'd endured). The next morning we got off to an early start toward the crater of Volcan Puyehue, which was only 10 KM away, but with an altitude gain of 2000 meters (over a mile) extremely steep. Around lunch time we reach the tree line and arrived at the refugio, a simple wood and tin building that slept 16, and had a small wood stove. We found out that the closest water source had dried up that morning, forcing several people to cut their trip short. Also, reports came in that the thermal baths we had planned to visit (another 10 KM ahead) had evaporated into mud pots during the dry spell, and the geyers were adversely effected as well. With this information, our three and a half day trek turned into a two day trip. We dropped our packs at the refugio, took our water bottles (I correctly guessed that the afternoon sun would produce a trickle at the base of the snow fields near the top of the volcano), and started toward the crater. It was a tough climb. The grade was very steep, there was absolutely no cover from the sun or wind, but worst of all, the ground was covered with a mixture of pumice-stone gravel, sand and rocks, such that if you didn't have a stone to step on your feet sunk in with each step. After about two and half hours of trudging, slipping and sweating, we reached the top. 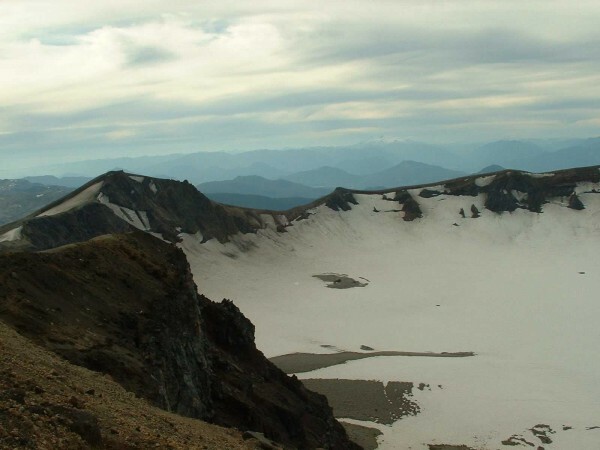 We could see Lago Puyehue, Volcan Osorno (and several other volcanic peaks), a black lava flow that was still cooling and vaporizing snow fields it encountered, and the snow-filled crater below us. The temperature was probably 15-20 degrees cooler at the top (I'd guess 50 F) than at the refugio, and the wind was relentless--we lasted for about 15 minutes at the top. The loose gravel and sand that was the bane of our existence on the ascent, was a blast on the trip down. We'd run down the hill, ankle deep in the pumice stones, then hit the brakes and slide several feet to a halt, then laugh our heads off. We reached the level of the volcano where plants were growing (and the temperature was much more comfortable) and waited for the sunset. That night at the refugio we had dinner with a couple from London and a young lady from Holland, and all enjoyed the fire in the wood stove.